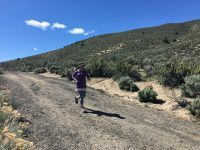 On April 23, 2016, I escaped a thick blanket of late new snow to run the Escape from Prison Hill Half Marathon, produced by one of our neighbor running clubs, the Tahoe Mountain Milers, in Carson City, Nevada. This was my first time on the course and it didn’t disappoint. There are so many reasons that I enjoy racing, and Escape from Prison Hill embodied all of them: experiencing new trails and scenery; first-class support; pushing yourself when you wouldn’t otherwise; and, above all, a strong sense of camaraderie and community. Carson City is a 75-minute drive from my home in Truckee. It sits at 4800’ of elevation in the Washoe Valley just east of Lake Tahoe. 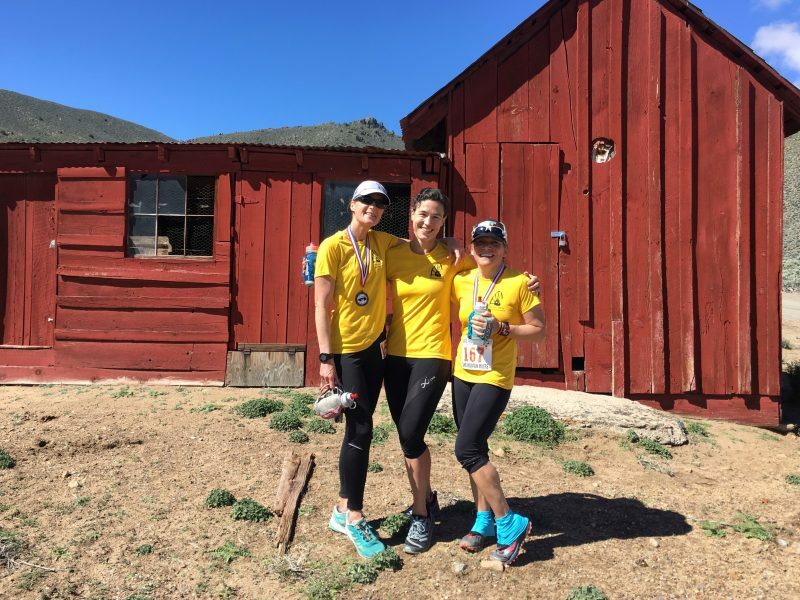 Escape From Prison Hill Half Marathon is run entirely on dirt starting at Silver Saddle Ranch. It features two big climbs and descents (2300’ of climbing,) then ends with about 2 miles of flat dirt road cruising. The terrain is open with lovely views and wildflowers going off. The day before the race, about 10” of heavy, wet snow fell at our house. Driving around town in a late-season storm is always difficult, because so many motorists are unprepared and our own studded-snows have usually been changed out for summer tires. As such, both of our vehicles ended up parked outside. Race morning started with digging out and picking up a crew of my fellow Donner Party Mountain Runners (DPMR) before heading down the hill. We drove out of the snow and into the brilliant rising sun. 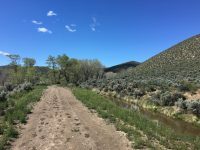 It would have been tricky to find pleasant trail running in Truckee that morning, but we were treated to dry, if slightly tacky, trails on the Prison Hill course. 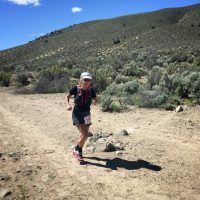 The Tahoe Mountain Milers put on first-class events all the way around. The course was well-marked and they even posted a volunteer to direct runners at one particularly tricky turn. The start/finish was chip timed and the aid stations were well-executed. 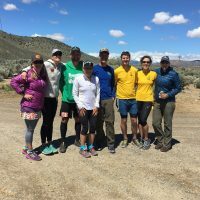 The aid station at the top of the second climb was staffed by another running club neighbor, the Silver State Striders. The familiar friendly faces go a long way in making it feel like a backyard race. The training week leading up to the race had been fraught with red flags for me. On three separate occasions my running buddies expressed that they were worried about me. The worst was trying to do mile intervals on flat trails. I would get about 90 seconds into the effort before I was gasping for air. I had been training through some health issues and taking medication that had some fairly unfriendly side-effects. Yet my legs felt strong after a winter of nordic skate skiing, TRX classes, and some snowshoe running. Before the race start, I gave my lungs a gentle 15-minutes warmup, but to no avail. After the first mile I struggled to catch my breath as it seemed the entire field passed me on the climb. I felt ok running the rollers at the top of the climb and even down-right good going downhill. I seemed to have no air for the final flat miles. I finished and felt fine enough to cruise around the course a bit longer. Although my time (2:16) was not particularly impressive, I felt grateful to be out there on that beautiful morning with the support of so many people helping me push through my body’s resistance for a solid training run. This was the first race of a busy Spring racing schedule, with the inaugural “Run the Burn” 50-miler just a week away. Click here for my Escape from Prison Hill activity on Strava.